On 3 November 2017 the Minister of Justice and Correctional Services announced in Government Gazette Number 41224 that the Master’s Fees on deceased estates will increase with effect from 1 January 2018. These charges will only apply to the estate of persons who die on or after 1 January 2018 or estates where the final appointment of the curator bonis or administrator is on or after 1 January 2018. 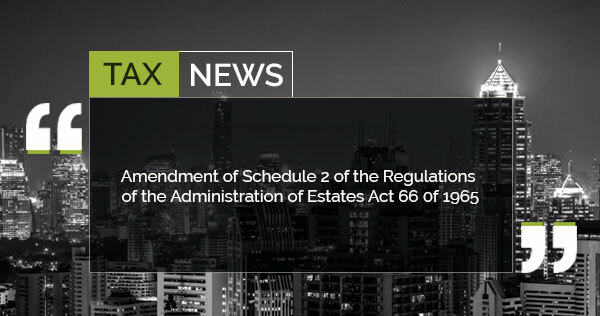 This increase will be on all estates of deceased persons or estates under curatorship or administration in terms of the Mental Health Care Act 17 of 2002 (with the exclusion of estates under the custody of an interim curator pending the appointment of an executor). If the gross value of the estate (in accordance to the executor / administrator’s account) is R400 000.00 or more, for every R100 000.00 in addition to the R400 000.00, a further R200.00 will be payable. The maximum Master’s Fees payable is capped at R7000.00. If the deceased was one of two spouses married in community of property the Master’s Fees will be determined by assessing the gross value of the assets in the joint estate. Government Gazette – 3 November 2017 – AmendmenA further amendment was announced pertaining to the fees charged for copies, certified copies and electronic copies at the Master’s Office. Kindly refer to the Government Gazette Number 41224 for the new charges.